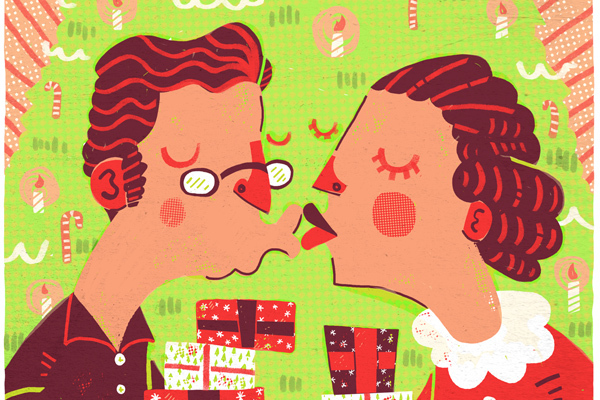 story by ron bishop | illustration by daniel hughesDuring our very happy, almost 15-year marriage, my wife Sheila and I have given each other every possible gift. Some, like my drum kit and handsomely battered briefcase, are revered. Others have been loved for a time or shelved and then, kindly dispatched to Goodwill. To avoid ending up on the TV show “Hoarders,” a new “rule of three” regarding presents to each other will go into effect this Christmas. We think it’s pretty straightforward: Three presents, one of which can be expensive. Congress should be able to write such a succinct law. My nine-year-old son may still be exempt; that amendment is still in committee. A second impetus for the rule is the discourse that informs and the behavior that attaches to gift-giving, at least in how the media tell the story. What we see and read suggests thinking about giving as an act of acquisition and distribution, a by-product of consumption, and in some homes, almost a blood sport. While it’s been true for some time that to adequately express your love for someone, you have to buy them something, it seems now you have to kill yourself to buy them something expensive, and definitely more than one. Or, perhaps how you go about obtaining the gift has become more important than the gift itself. Shrinking in our cultural rearview mirror are less aggressive tales of giving—The Gift of the Magi, for example, or A Charlie Brown Christmas. Stories like these, and The Grinch Who Stole Christmas, are quaint, but they have to be amped up—or in the case of The Grinch re-mastered (and soul-altered) into a frantic Jim Carrey version—if they’re to sustain the volume of the media’s holiday onslaught. Holiday-themed ads seem to hit the air days after the Fourth of July. Stores erect their Christmas trees and menorahs seconds after that. And a decade ago, after this nation’s worst terrorist attack, we were urged to confirm our patriotism and ease the country’s pain by heading to the nearest mall. That’s a lot of pressure. Then, there’s the coverage of giving and, a little more broadly, the holidays. What are we told as the holidays approach? That traffic will be impossible as our friends and neighbors clog the roadways trying to get to the mall, and later, to grandma’s house. That the nation’s weak economic recovery depends on how much we contribute to the coffers of area merchants. Everywhere you look, more pressure. Shouting loudest is the frantic coverage of Black Friday, and of late, the weeklong lead-up to Black Friday. Don’t worry about the risk to your personal safety, we’re told—set four alarms and climb over your family to get to the mall as early as possible! Camp out the night before if you have to! The best deals on items you didn’t know you wanted await on the other side of these doors. Later, news helicopters scour shopping mall parking lots. They fix their cameras on shoppers robotically heading in and out, emptying their wallets and filling their carts. When defining news in my journalism class, I include the phrase “breaks through the routine.” Unless someone is killed in the crush of humanity struggling to buy the year’s hot toy, as has tragically happened a few times, the fact that lots of people are scrambling to buy gifts at holiday time simply doesn’t live up to that phrase. Yet we’ve been educated to think that this annual rite of holiday madness is worth the hours of breathless coverage devoted to it. And finally, there’s the morning—or eight days and nights—we all wait for, and have since we were kids. In ads, movies and shows, presents are tossed to their recipients; gift bags are gathered for reuse and wrapping paper is decimated; its shards float to the ground in a tiny tickertape parade. Loud thank-yous and quick kisses are exchanged. The booty is then bagged, trucked to the car and taken home. Through it all, there’s not a lick of simplicity, of calm, of bright—no scale whatsoever in the media’s story of our gift-giving tendencies. Even though it’s more accurate to say the media tells us what to think about rather than what to think, we’re made to look as though we’re crazed, covetous shopaholics who have adopted a mercenary approach to what must at one time have been a simple, kind act. Hence the “rule of three.” Check back after the first of the year to see how we did. Ron Bishop is a professor in Culture and Communication at Drexel University. He is the author of More: The Vanishing of Scale in an Over-the-Top Nation (August 2011, Baylor University Press). Send comments to bishoprc@drexel.edu.